and most importantly, how to fix drainage problems and prevent them in the future. The Drain Man is a proud member of the Master Plumbers Association of Australia. 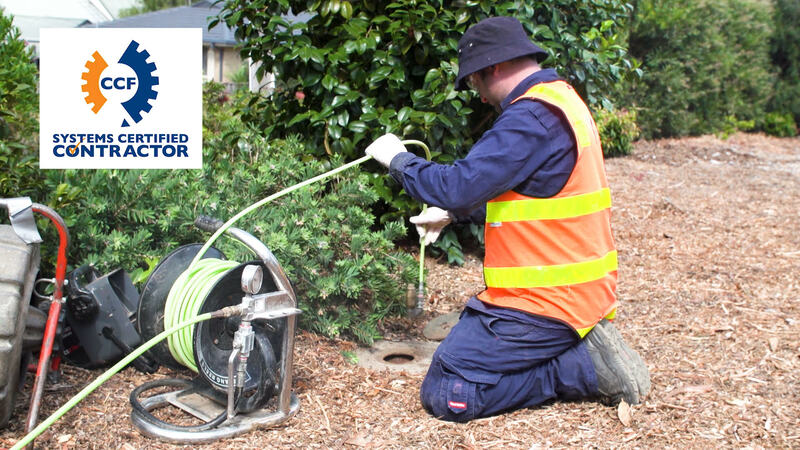 We specialise in drain-clearing operations throughout the Sydney and Melbourne Metropolitan areas. We understand the need for prompt, reliable and effective service when a drain blockage occurs. Our service teams are equipped with the latest, most advanced drain-clearing equipment required to handle every imaginable drain clearing situation. Drilling equipment to remove concrete, debris from drains etc. We pride ourselves on providing prompt and reliable customer service. We’ll find an appointment time that suits you, and should we experience delays, we’ll keep you – our customers – informed. clean up and take away all our own mess! If you have any questions or queries, or you need a pricing estimate on a drain clearing job at your premises, our friendly staff will be happy to help in any way we can. Travel time is included in our rates. We accept cash or credit card payments. We have Public Liability Insurance up to $20 million and our Victorian Building Authority Plumbing Licence Number is 39338.